Q: When are the new 2011 Free Agent models available? A: All of the new 2011 models are available now! Contact your Free Agent dealer for the latest information. 2010 models may still be available at your Free Agent dealer, but time is running out, and soon all the 2010 models will be gone. Q: How can I get a 2011 Free Agent catalog? A: You can download a 3.4MB pdf or you can e-mail us and leave your mailing address to receive a printed copy. A: You can purchase a Free Agent bicycle from any authorized Free Agent bicycle dealer. Please check the U.S. Dealers page for a dealer in your area. If you do not see a dealer listed in your area, please ask your local bicycle dealer to contact Free Agent. A: Select Free Agent merchandise is available on the freeagentbmx.com website at the Free Agent Factory Store. Other Free Agent bike parts are available at most bicycle dealers. Q: What is Free Agent's warranty policy? A: Free Agent bicycles are guaranteed to be free of defects in materials and workmanship. Chromoly frames are guaranteed for 25 years. Aluminum frames are guaranteed for 5 years. Forks and all parts are guaranteed for 1 year. Q: Can I get Free Agent logos or desktop images? A: Free Agent logos and desktop images are available on the downloads page of our website. A: Free Agent frame decals are available for sale through Free Agent bicycle dealers. If they don't have the color you need, they can order these for you. 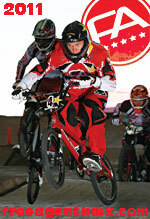 A: If you would like to be considered for selection for the Free Agent BMX team, please fill out the R.A.C.E.R. program and mail or e-mail or fax to Free Agent.